Snifberg the Unfeeling is a large Ice Snifit that appears in Yoshi's Woolly World and Poochy & Yoshi's Woolly World as the boss of World 5 in the level Snifberg the Unfeeling's Castle. It was originally a normal Ice Snifit that Kamek had made giant. Collecting all of the Wonder Wool on that stage unlocks a Yoshi costume called "Snifberg the Yoshi". Snifberg the Unfeeling can be seen in the Scrapbook Theater as enemy number 71 and also appears in the Boss Tent. Snifberg the Unfeeling looks similar to its original Ice Snifit form, with the main difference being its large size. It is able to shoot regular Ice Snifits out of the nozzle on its mask. The mask itself is made of wood, while the rest of Snifberg the Unfeeling's body is made of wool. As Kamek mentions, Snifberg the Unfeeling is wearing a parka. Once the battle initiates, Snifberg the Unfeeling spins in place while blowing ice, creating an ice barrier around itself. This ice barrier prevents Snifberg the Unfeeling from being jumped on or attacked directly. Snifberg the Unfeeling's first attack consists of creating an ice block, which it then kicks towards Yoshi. It will then spit out three Ice Snifits, one after the other. Afterwards, Snifberg the Unfeeling creates spikes on its ice barrier, then proceeds to slam along the ground until the last turn, when it flies up by spraying ice out of its nozzle and slams into the ground. Yoshi must hit Snifberg the Unfeeling three times in a row with a Yarn Ball, Watermelon's seeds, or Fire Watermelon's fire breath, causing it to fall over onto ice spikes which break the ice barrier. The Ice Watermelon, on the other hand, doesn't work. Yoshi then needs to Ground Pound him. 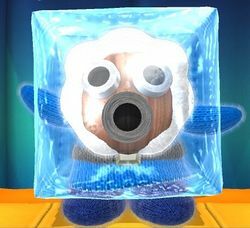 Once hit, Snifberg the Unfeeling flies into the background, remakes its ice barrier and creates Icy Spiked Balls, which appear two at a time and roll down towards Yoshi. Once finished, Snifberg the Unfeeling jumps down and creates five more ice blocks, with two of them being taller than usual. It then spits three Ice Snifits, this time all at the same time. Snifberg the Unfeeling creates spikes on its barrier once more, then flies up and slams onto the ground twice. Once hit for the second time, Snifberg the Unfeeling flies to the background, creates another ice barrier and more Icy Spiked Balls, and finally jumps to the foreground again. It then creates a stack of five ice blocks and four Icy Spiked Balls and kicks them at Yoshi. Snifberg the Unfeeling then spits five Ice Snifits at Yoshi, creates spikes on its ice barrier and slams onto the ground three times. Once hit again, Snifberg the Unfeeling is defeated. This page was last edited on December 9, 2018, at 19:56.